Welcome on Dental Ceramic Studio website. The laboratory was founded in 2006 as a result of many years' experience in the country and abroad. Our idea is to focus on aesthetics and functionality of large prosthetic reconstructions. We offer our prosthetic services to dental clinics. In our lab we choose and adjust individually colour and shape of future crowns, veneers and bridges. Patient has direct contact with prosthetic technician who creates his prosthetic filling and that highly improves quality and speed of work. We use latest achievements in cosmetic dentistry - CERCON. This material doesn't require using metal substructure. CERCON usage gives lots of possibilities to restore smile aesthetics. It is white, so the look of porcelain crown and bridges. 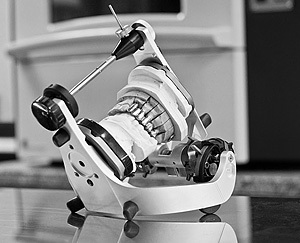 CERCON limits the risk of allergies and makes prosthetic work more precise. This material guarantees durability, aesthetics and high quality of prosthetic reconstruction. In the Laboratory we adjust colour and advise in choosing veneers shape. Adjustments are made from Monday to Friday from 10 to 17 after earlier phone confirmation. In case you have any doubts or questions please contact us by phone or email. Our team will provide you all needed information. We are doing photographic documentation on request. We can take measurements with face bow. When it comes to alginate impressions we prefer hydrogum5 mass Zhermack's company.